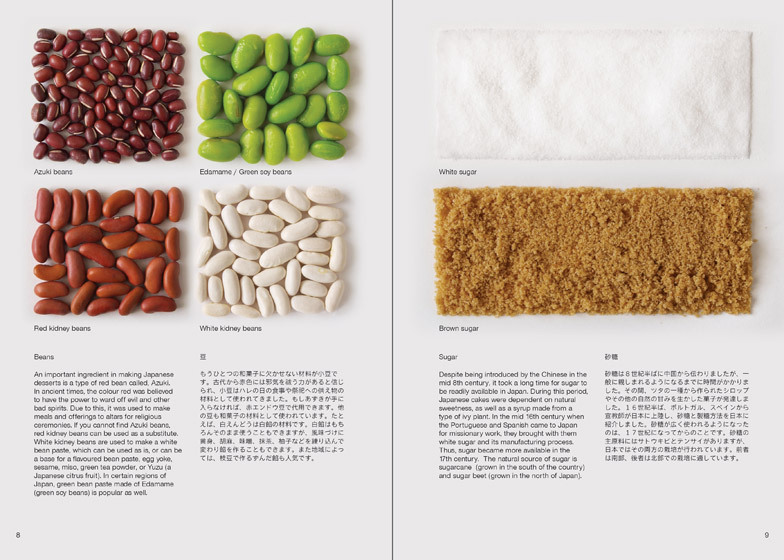 Ingredients are displayed like fabric samples to help western readers recreate traditional Japanese sweets with common foods, in this cookbook by designer Moé Takemura. Moé Takemura created Foreign Japanese Sweets as a beginner's guide to making snacks from the Far East, using ingredients found in western countries. "Our food culture is gradually becoming more multicultural, and everyday people enjoy foods such as hamburgers, pizza, pasta and curry," said Takemura. "Despite this variety, the coffee/tea break snack is still limited to European desserts like cookies and cakes. Why not step outside of your comfort zone and experiment with some delicious and healthy Japanese sweets?" Originally from Japan, Takemura has lived in both Sweden and Canada – where authentic ingredients needed to create the treats are often harder to come by. The book suggests suitable substitutes that are easier to obtain from western shops and shows how they can be made into healthy snacks. "Many people may not know, but Japanese desserts are often gluten free and vegan friendly," said the designer. "For example, many recipes use rice flour instead of wheat flour, and bean paste instead of cream and chocolate." The cover shows six of these neutrally coloured ingredients arranged in neat lines above the title. Step-by-step recipes printed in both English and Japanese are laid out in black text on beige paper. Ingredients and preparation stages are photographed by Takemura from above, with pans and chopping boards arranged at the same angle in each instance to give the pages a consistent graphic style. The recipe book is a follow-up to Takemura's Guide to the Foreign Japanese Kitchen, created two and a half years ago to show how to make traditional Japanese meals – also edited and printed in Swedish. "The book follows the same aesthetics – it's simple and clean, and shows step-by-step cooking process," Takemura said. Both publications are available through print-on-demand service Blurb, which was also used to create our one-off 3D-printing magazine Print Shift last year.